Hi, everyone. 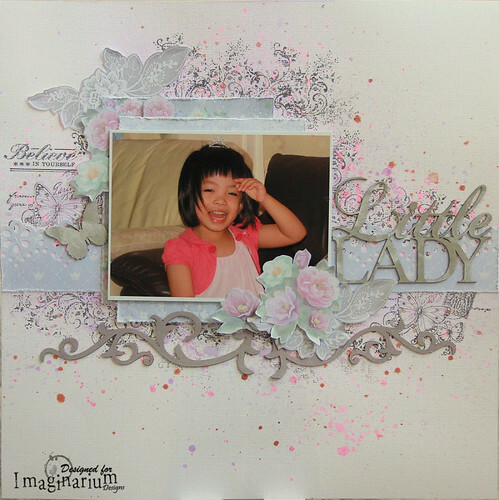 Today at Imaginarium Designs, I'm sharing 2 layouts with stamped background using same sets of stamps. I used white cardstock as base for both layouts. This picture of my girl was taken on her birthday party. Love her sweet smile. My little Lady!! "You Smile With Your Heart"
This is one of my favourite photo of my girl taken at Upper Pierce Reservoir. Do hop over to Imaginarium Designs to read more details and see more pictures of my layouts. And do leave a comment to win a pack of chipboards from Imaginarium Designs.